Ear infections, known medically as 'Otitis,' are a very common health issue often caused by a bacterial or viral infection of the middle ear (an area found just behind the ear drum.) When the ear is infected, fluid can build up in these areas causing pressure and pain. Fever can also be associated with ear infections, especially in children where they are most common. Around 75% of ear infections occur in children under 10 with one in four children having at least one ear infection by the time they reach their teens. Most ear infections occur when we are suffering from a bacterial or viral infection such as a cold or flu. This is due to the high level of mucus produced by our bodies that becomes infected around the ear area. Ear infections can also be the result of a blockage of our Eustachian tubes (the tube that help to regulate air pressure in the middle ear). In children, these tubes are much narrower, allowing them to clog more easily. How can Apple Cider Vinegar help with Ear Infections? Apple cider vinegar is a powerful natural remedy that has anti-viral, anti-fungal and anti-bacterial properties and has been used in traditional medicine for thousands of years. Applying ACV to your ear when suffering from an infection helps to kill any unwanted germs, reduces mucus and balances the pH levels of the inner ear. The first thing to do is find a comfy location as this remedy involves lying on your side for around 10 minutes. You will need a dropper of some type as well a bottle of high quality, raw apple cider vinegar. Make a 1:1 solution of apple cider vinegar and water and add some to your ear dropper. Lie on your side in your chosen comfy location and drop 3 - 5 drops into the affected ear. Now it is a waiting game. 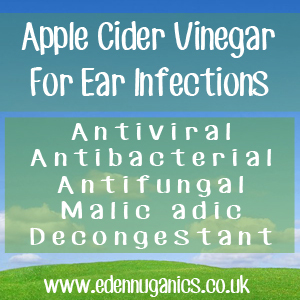 It's best to leave the vinegar in your ear for a minimum of 5 minutes, but no longer than a quarter of an hour as ACV contains natural acids and our ears are very delicate. Once time is up, turn onto your other side and allow your ear to drain on a clean towel or tissue. This can be repeated once a day for up to a week. If symptoms persist beyond this point we recommend contacting your health care professional. Ear drops are great at getting right to the problem area, but our bodies can't absorb the healthy nutrients ACV has to offer though the ears. Drinking apple cider vinegar when suffering from an ear infection can help to boost our body's natural defences and the antiviral properties help to speed up recovery after colds and flu. The first thing to do is fill a glass with warm water, making sure that it is not too hot as this will damage the enzymes. Next, add a large spoonful of apple cider vinegar and stir the drink. Honey is a great addition to this mixture as it hides the somewhat tart taste of ACV. Drink this twice a day while suffering from an ear infection. Gargling with the drink can also help to reduce mucus and combat infection. Hydrogen peroxide - H2O2 is water with an extra oxygen molecule that can help to clean and disinfect the inner ear as well as remove foreign particles. Make sure to only use food grade hydrogen peroxide with a strength of 3% or less when treating ear infections. Colloidal silver - Another powerful natural remedy in the treatment of ear infections is colloidal silver. Simply drop a few drops into the infected ear 3 times a day and within days the antiviral and anti-fungal properties of the silver particles will disinfect the ear.